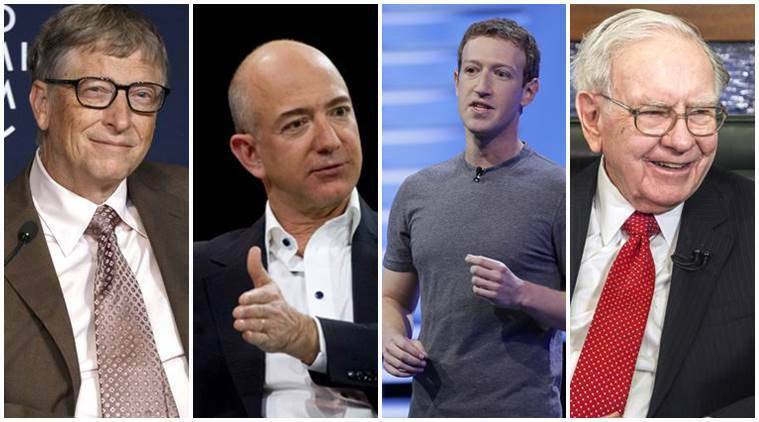 Richest people in the world: a look at the who's who of the ten wealthiest people. Richest people in the world: Bill Gates at number 1, Jeff Bezos at number 4, Mark Zuckerberg at number 8 and Warren Buffett at number 3. In a world with booming entrepreneurship success stories, success is often measured by the value one has in terms of money. The success, however, is years of hard work and toil that gets people where they are today. Bloomberg has released a list of the ten richest people in the world, with their net worth in billions of dollars. They profiled 200 billionaires for the exercise. We look at the who’s who of the list. The co-founder of Microsoft, tech magnate, entrepreneur, philanthropist, programmer, Bill Gates has a solid profile that makes him the richest individual, his worth marked $85.9 billion. Also the founder of Bill & Melinda Gates Foundation, Gates has made strides in every sphere he has touched. He stepped down as CEO of Microsoft in 2000 and as Chairman in 2008. Currently, he works full-time at the Bill & Melinda Gates Foundation and is the technology adviser to the current CEO Satya Nadella. Founder and chairman of the Inditex fashion group, which is best known for its global brand Zara, the Spanish business magnate is valued at $75.8 billion and is the second richest person in the world. The most successful investor in the world, Buffett is also a business magnate and a philanthropist, valued at $68.2 billion. He is the CEO and the largest shareholder of Berkshire Hathway, the American multinational conglomerate holding company. Buffett, the third richest person in the world, is often referred to as the “Wizard of Omaha” or “Oracle of Omaha,” or the “Sage of Omaha,”and is noted for his adherence to value investing and for his personal frugality despite his immense wealth. Founder chairman and the largest shareholder of the online shopping giant Amazon, Bezos is an American technology entrepreneur and investor, valued at $63.1 billion, the fourth richest person in the world. Bezos’ other business interests include aerospace and newspapers. He is the founder and owner of the privately-funded aerospace developer and manufacturer Blue Origin. Founded in 2000, the company has conducted test flights to space beginning in 2015, and plans for commercial suborbital human spaceflight beginning in 2018. He also purchased The Washington Post newspaper in 2013. Valued at $55.2 billion, American businessman, political donor and philanthropist Charles Koch is the fifth richest person in the world. He is co-owner, chairman of the board, and chief executive officer of Koch Industries, famous also for its mention in an popular American TV show The Newsroom. He owns 42% of the shares of the conglomerate. Brother of Charles Koch, David Koch is the Executive Vice President of Koch Industries. Valued the same as his brother at $55.2 billion, David is the sixth richest person in the world. David also owns 42% of the conglomerate that the brother inherited from their father and then expanded. Slim is a Mexican business magnate, investor, and philanthropist who is the seventh richest person in the world, valued at $51.4 billion. Slim is known as the “Warren Buffett of Mexico”, deriving his fortune from his extensive holdings in a considerable number of Mexican companies through his conglomerate, Grupo Carso. Zuckerberg, co-founder and CEO of Facebook, is the eight richest person in the world valued at $49.7 billion. American programmer, Internet entrepreneur, and philanthropist, he founded Facebook from his college dorm room in Harvard. The website later expanded rapidly with one billion users signing up by 2012. American businessman Larry Ellison is co-founder of Oracle Corporation and was CEO until September 2014. Valued at $43.4 billion, he is currently the ninth richest person in the world. Currently, he is the executive chairman and chief technology officer of Oracle. Ellison has donated up to 1% of his wealth to charity and has signed The Giving Pledge. The Swedish business magnate, founder of the famous IKEA, is ranked the tenth richest person in the world at $42.5 billion. The Swedish retail company is the largest furniture selling company (as of 2008). Kamprad currently lives in Sweden. you make blogging glance easy. The total glance of your site is fantastic, as smartly as the content material!